Yogi Bear is often seen making evening rounds amongst our camping families. City close & country quiet. Great nearby attractions & shopping. 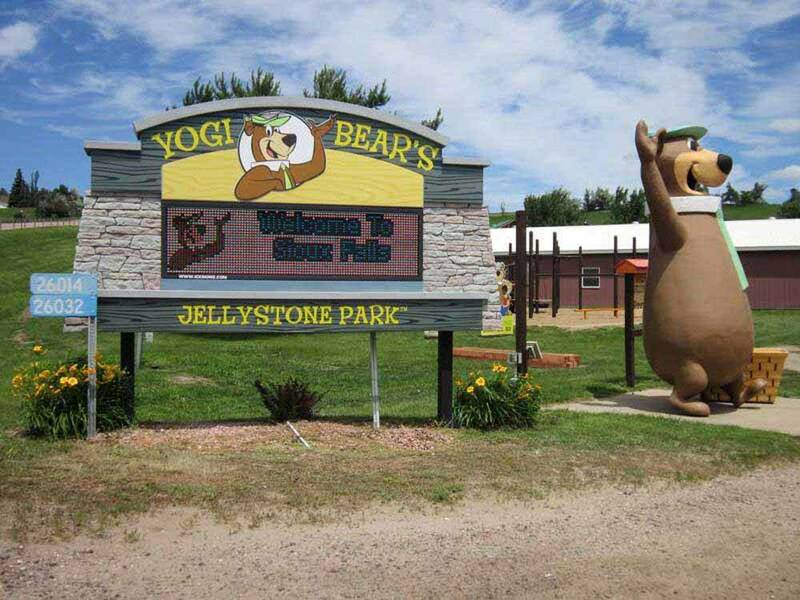 The goal for Sioux Falls Jellystone Park: best service, quality & value. We stayed off season -2nd week of Sept. The pool was still open but kid activities closed during weekdays. On weekends they were active. The corn maze is huge! The sites are large. We had no problems getting in and out with a 44' 5th and long bed dually. Cable channels were clear. Verizon cell was excellent I was getting 40mbps with my mobile hotspot. The parks campground Wi-Fi seemed better than most, but we use our own data plan. Grounds were clean, spacious, plenty of room for dogs. During the week was only a handful of other travelers. Weekenders fill up on weekends. Had site 112 which was huge and faced the cornfield so we had a lovely view (and not the back of another rig) staff was very friendly, mostly college age kids. No complaints, we would definitely go back. The best part was the space of the spots, even if the park is crowded, you still have room to breathe. Jelly Stone Sioux Falls, SD. Well designed campground. Each site for campers was a pull through and had a mature tree. The showers were new and very nice. The pool was not as clean as it could be. The hot tub had something in the filter that I do not want to speculate as too its origin. A plus was that the campground was easy on and off RT 90. However, this was a minus as well with the sound of traffic on the interstate. Staff was friendly and Yogi Bear was even riding around in a golf cart. The kids had a blast here! Bouncy pillow, pool, golf! The gravel site was not very level, but the space between campers was OK, and the Wifi worked. nice rv park with pool and kids activities. Wifi slow when available. Cable ok about 20 channels, Small store with beer, ice cream, snacks and ice. Would stay again if in area for a night. This park was awesome for anyone that has children. It is kept up and very clean with lots of activities. However, my only concern is lots of young people without a lot of customer service experience. They are not bad just they are not as friendly and it is obvious they are doing this as a job. Great location to get around, and easy access off of Rt90 yet still fairly quiet for being close to highway. Everyone was friendly and accommodating. Most of the stays were those traveling through the area just like us. We decided to stay 3 nights to see a few things and catch up on laundry, groceries, etc. We used the pool which was nice although a little small for the amount of people using it. Don't miss Falls Park in Souix Falls, beautiful! And the historic downtown area is very nice to walk or bike! Easy to find just off I90iin Sioux Falls SD. All sites are gravel and level with lots of pull thrus with full hookups. Restrooms laundromat are kept clean but not enough of them, only one, for the size of the campground. Pool and play area are nice and clean. The WIFI was not very good at our site. The campground staff are very helpful polite. We stayed for one night on our trip heading west. Our pull-thru site was clean and easily accessible with our 35' fifth wheel. Bathroom and shower were very clean and very nice. Kids loved the pool and bounce pad. They had kettcars for rent as well. Easy on/off the interstate. Would definitely stay there again. This is a great place to stay outside Sioux Falls. Close to highway but not a lot of noise. Easy in and out. Great pool, office, and staff. Shady spaces. Good cable and wifi. Also had fenced dog park. Although we did not have children with us, there were plenty of activities available for kids. Would recommend.